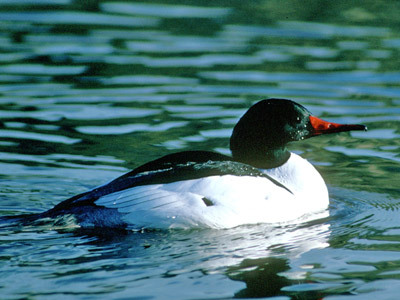 The common merganser winters in the Chesapeake Bay watershed, on inland water bodies as well as saltwater creeks and bays. Common mergansers sometimes feed together with hooded and red-breasted mergansers, diving ducks, sea ducks, cormorants, grebes, and loons. Like other mergansers, this species is equipped with a serrated bill for catching fish. 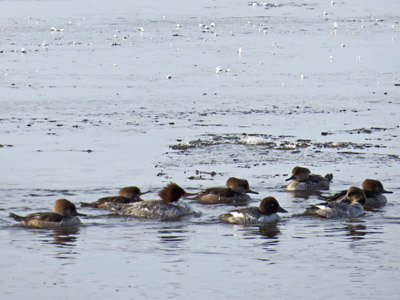 Females of the species can be distinguished from other mergansers by their large size, reddish heads, and silver backs.